A retailer accepts an order from the end-user. The seller orders the product from the product’s manufacturer, wholesaler or retailer. The retailer resells the product to the end-user at a markup. A dropshipper does not have to commit thousands of dollars upfront to building inventory. With dropshipping, you purchase the product only after making a sale to a paid customer. Because of this, anybody can start their own ecommerce store without a hefty financial investment. Retailers usually have to deal with a ton of overhead on storage, packing and shipping, inventory recording, returns, incoming shipments, and placing periodic orders to match the company’s SOP on managing stock quantity. Dropshippers can eliminate these costs without sacrificing growth or sales capacity since they will almost never physically handle the products they order. The lack of a dedicated brick-and-mortar location and warehouse means you are free to conduct business wherever you can find an internet connection. If you can communicate with suppliers and customers, managing your ecommerce store shouldn’t be too challenging. In addition to no longer requiring on hand inventory, you are free to choose whatever products you wish to resell from any legitimate supplier. As long as they can provide it, you can sell it. Traditional businesses must expand their production and storage capacities as business grows, but dropshippers don’t. Dropshippers growth mainly means that you’ll have to do more added-value in non-pricing terms tasks, mostly customer service-related. In the end, scaling the business is much simpler with the dropshipping model. Now that we know what dropshipping is and what we can gain from it, let’s discuss the steps needed to start our own online business with Shopify. First of all, you’ll need a Shopfiy account to run your own ecommerce business. 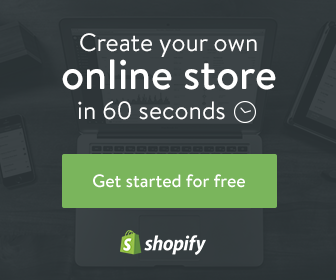 Open the Shopify website and click the Get Started button. You will be prompted to input your email address, password and the name of your store. The following page will ask you to enter your personal information (First and Last Name, Street Address, etc.) for currency and tax purposes. After filling the page and clicking next, you will need to tell Shopify your expected annual revenue and whether you’re already selling. After you’ve setup your online business page, you’ll need to add a product you to sell. A step-by-step guide will show you where you need to go to add products to your page. Fill in the product title, description, price and vendor. Remember to click the save button after entering data of the product. On your dashboard you’ll see the Customize the Look of Your Site button. Clicking it will open a window where you can add logos and change the page’s color scheme. You can visit the theme store to look through hundreds of templates to add character to your page. Return to the dashboard and click where it says “Add a Domain.” You will be given the option to transfer an existing domain or register a new one. After selecting the domain, follow the steps to finalize you domain purchase. Go back to your dashboard and click on the Payments tab. You can choose from a list of several third-party payment gateways like PayPal and stripe. Shopify also has their own easy-to-use payment gateway if you don’t want to use a third-party one. Congratulations! You are now a proud online business owner, ready to make money. However, for the newbies out there who don’t have a product to sell or don’t know how to establish a working relationship with a manufacturer/wholesaler, then keep reading. Manufacturers very rarely conduct business directly with end-users since they do business-to-business deals in substantial quantities. You most likely won’t be able to strike a dropshipping deal with the manufacturer but you can ask them to supply you with contact information of their wholesalers. Talk to their wholesalers and see whether they can fulfill dropship requests. Oberlo’s service lets you import products straight from AliExpress – an online Chinese retailer who caters to the international market. Oberlo also provides other services such as automated order fulfillment, updated inventory and price information and product customization. Oberlo is directly integrated into Shopify’s ecommerce platform so it is definitely worth considering. If you are having difficulties locating or finding a reliable supplier, you may have to resort to the classic trick of ordering a product from a competitor who dropships and Google the return address of the package. It may not always work since the address may not be recorded anywhere online, but most of the time you’ll discover who the original supplier is. Contact them and see whether you can start a dropshipping account with them. There are various supplier directories that offer a comprehensive list of manufacturers, wholesalers and service providers for an annual subscription fee. Some of these directories have an extremely strict guideline for filtering quality wholesalers from the fakes so you know you’ll get information of only the best companies. Annual subscription costs vary from directory to directory, but you can also pay a one-time sum for lifetime access. If you are still unsure what product to sell or which supplier to collaborate with, running a simple Google search can be of tremendous help. You might have to do extensive research on the search results since wholesalers are generally pretty bad at marketing their products, and most of their sites still sport a 90s-them interface. However, don’t fault them if you get a blast from the past from their homepage; they may be legitimate wholesalers who just don’t see the need to update their online presence. In addition, using modifiers like “bulk” or “warehouse” will limit the search results to companies that can fulfill your specific demand. Using the fundamentals learned from this article, you should be able to turn your dreams of running an online store into a reality. Dropshipping eliminates several risk factors that conventional retailers stress over. As long as you polish your communication skills, you too can become a successful business owner.